It has been a couple years since I last posted a build thread. Decided to build another whimsical layout this winter. Following my past practices I built the frame 54" x 25" and decide on two continuous loops, one below and one above. This provides for more activity when displayed. 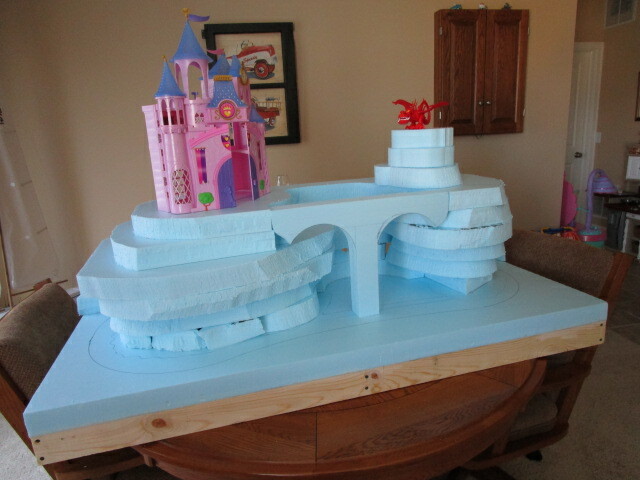 Looking around for ideas I found a toy castle of my granddaughters and decided a castle on one side with a dragon on a mountain on the other side. 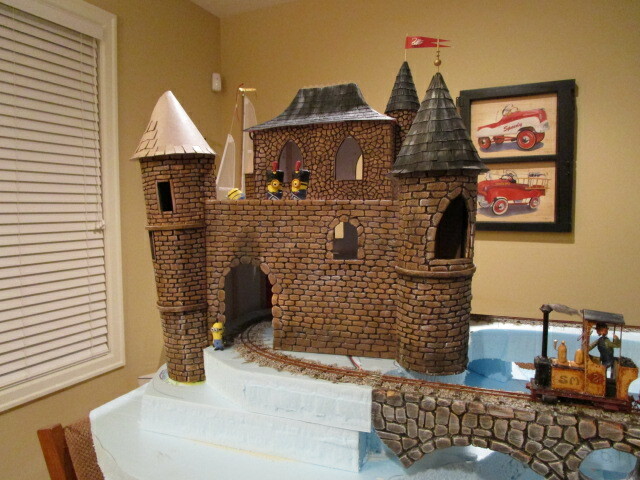 A stone arch bridge will connect the two sides in the front and a maybe a drawbridge in the back. I wrestled with the decision on whether to make it Gn15 or Gnine. I settled on Gnine because of the quirkiness and my Strawberry Mountain layout has been very reliable running 8 to 9 hours daily at several show over the past few years. 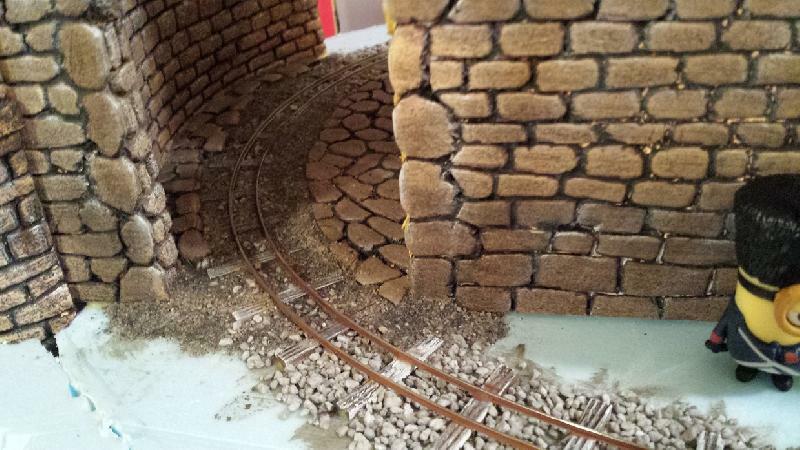 Track was laid and ballasted, bridge built and castle begun. I found a suitable dragon at the toy store. Once painted it should have the right character. I decided to use Minions as they are popular, recognizable, available and should be a hit with the younger population at shows. 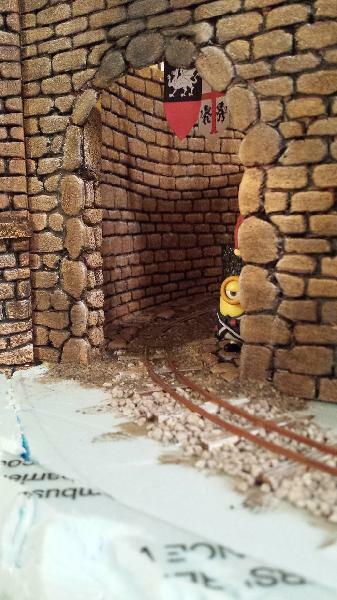 Besides, minions have existed since the beginning of time and have influenced many historical events! The castle is coming along. Built with foam board. After removing paper from one side I carve the stones into the foam. For the towers I first peeled the paper from both sides and using spray adhesive wrapped the foam around mailing tubes. Then I carved the stone. 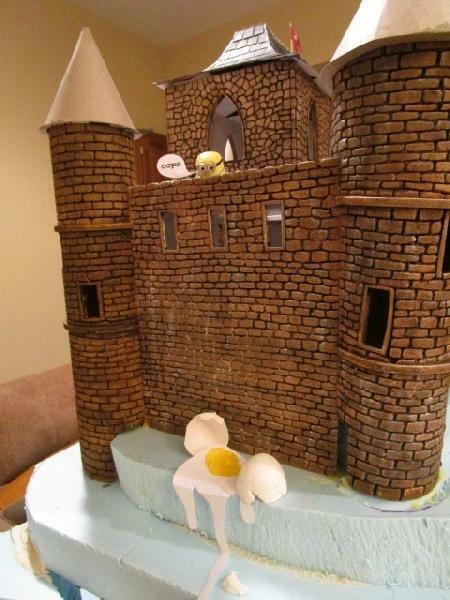 This is a mockup of the site of Humpty Dumpty's great fall. Appears that minions were involved in this bit of history too. Last edited by Bob Roegge on Wed Nov 25, 2015 1:27 pm, edited 2 times in total. What else can one say except 'cracking'! Interests: Trains. What else ? Being an expert in french I had the correctly typed subject. Must have been the minions that messed it up. You know they ruined things for Napoleon at Waterloo in 1815? Now, where do I find a french keyboard. Thanks....subject is corrected now. Whatever language is used... this is becoming quite impressive. I really like your stone work. Could you post a few pictures showing the technique you used for carving and coloring the stones please? I MUST copy this. Simply study Bob´s previous layout threads, such as High Trestle Creek or Strawberry Mountains. You can learn more about carving bluefoam and painting than you will ever need for the rest of your life. I was missing Bob Roegge already in here. So i am very happy, to see, he is sharing the building of annother layout with us. My local dragons and the hamster occupied seats in the first row to follow the building of the "Broken Egg Castle" adventure. Nevadablue wrote: Whatever language is used... this is becoming quite impressive. I really like your stone work. Could you post a few pictures showing the technique you used for carving and coloring the stones please? I MUST copy this. Very simple stone work. I used 1/4" foamboard. Be careful to buy the cheap stuff as the paper covering the foam will peel off easily. The quality foamboard is a pain. Remove the paper from one side, draw your pattern and carve with a #11 exacto blade. Then I use an empty ball point pen to contour the stones. For the towers I removed the paper from both sides of the foamboard and then used spray adhesive to attach to "mailing tube" and then did stone carving. Painting was also easy. I used naples yellow artist acrylic as a base color. When dry I painted raw umber artist acrylic over it using a bit of water to ensure it went into cracks. While wet I wiped it off with a paper towel until I was pleased with the result. Don't be afraid to remove to much as you can always add more. When dry I dry brush with white etc to highlight the stones. Note I have not finished any of the stonework yet. I am waiting until the castle is complete so as to blend all areas. If you look at the thread on Old World Charm you will see various different surfaces done with this simple technique. There is stone, stucco, brick etc. The fine foam surface when painted really gives some great textures. You can also distress it. Thicker foamboard such as 1/2" gives enough depth to actually carve stones for great depth. Juergen, Thank you for the kind comments. I very much enjoy watching your adventures. Your creatures have inspired me. Be watching in Modeling Matters as I am about to begin a pizza sized model with Ratatouille figures. Excellent work as usual, fantastic painting on the bridge and castle! 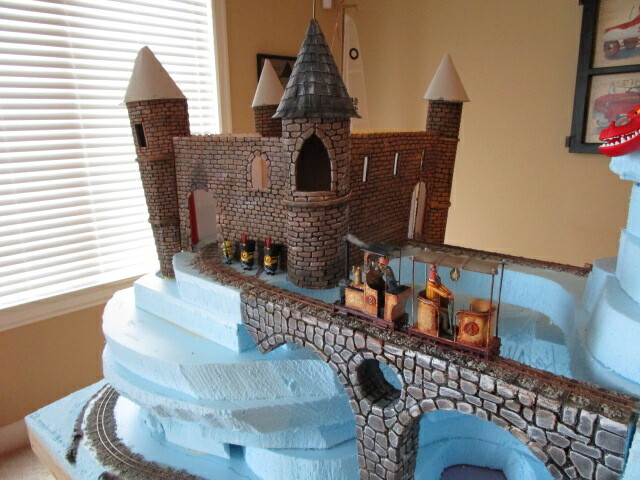 The toy castle looked like it has plenty of parts to use, yet the model looks mainly scratchbuilt. Have I missed something? 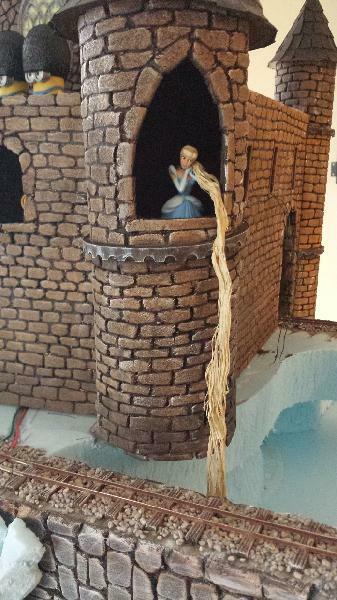 Re-reading the original post, I assume your grand daughter did not let you use her castle! rue_d_etropal wrote: The toy castle looked like it has plenty of parts to use, yet the model looks mainly scratchbuilt. Have I missed something? 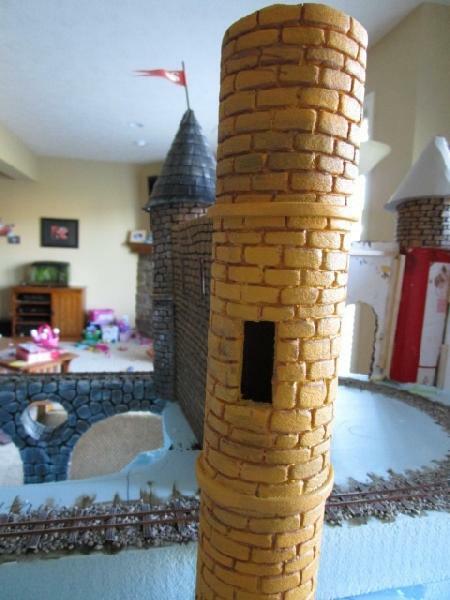 Re-reading the original post, I assume your grand daughter did not let you use her castle! 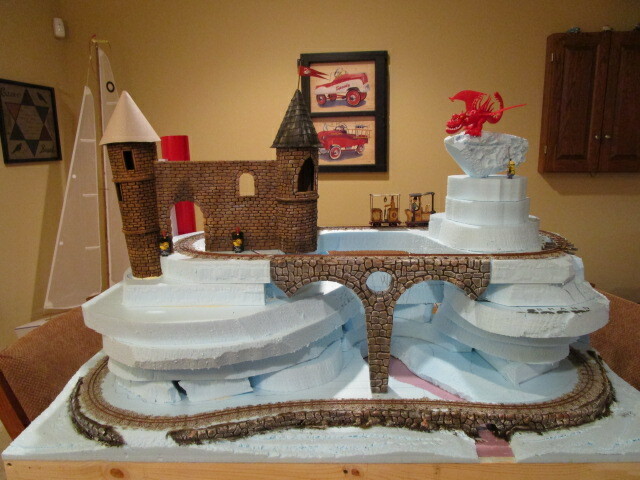 The toy castle was only used as a mock up of the layout idea. Too small to use and would not fit the shape of the mountain. Besides, I like to scratch build as much as possible. Took a little time off to build the "Who Cut the Cheese" layout. Getting back to work again on this endevour. I painted the dragon. Will need to do a little more work to him. I found a neat little mechanism that will allow me to animate the wings and mouth. I will have to do the mountain scenery work before I can install it. 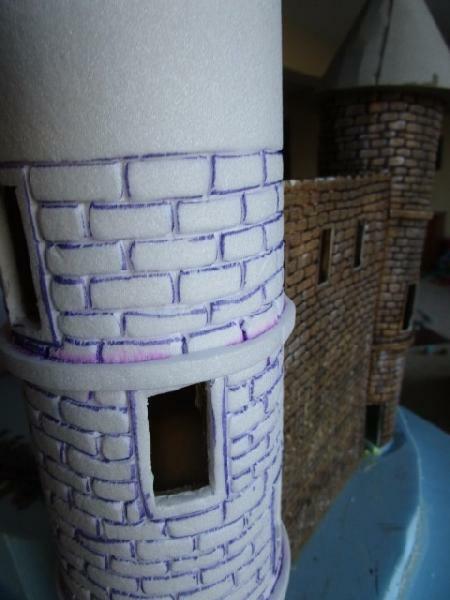 Began working on castle interior. Want to create the impression that it is not a hollow box but, has life inside. Based on this start I think it will work out fine. I hadn't realised just how fab that dragon was. Great repaint job. 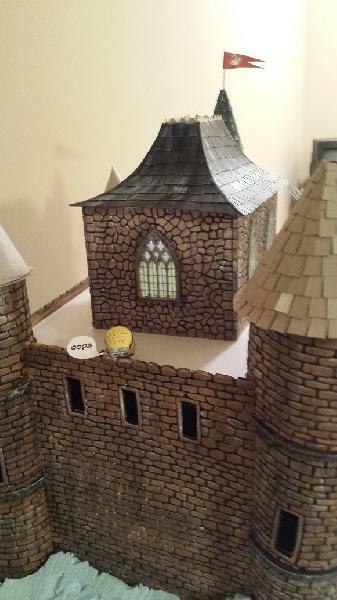 A friend recently bought a 3D printer and made me cathedral windows for the castle. Can't imagine having to scratch build. The interior is now complete. Finishing the exterior is next. I will not be able to put off starting on the mountain much longer. 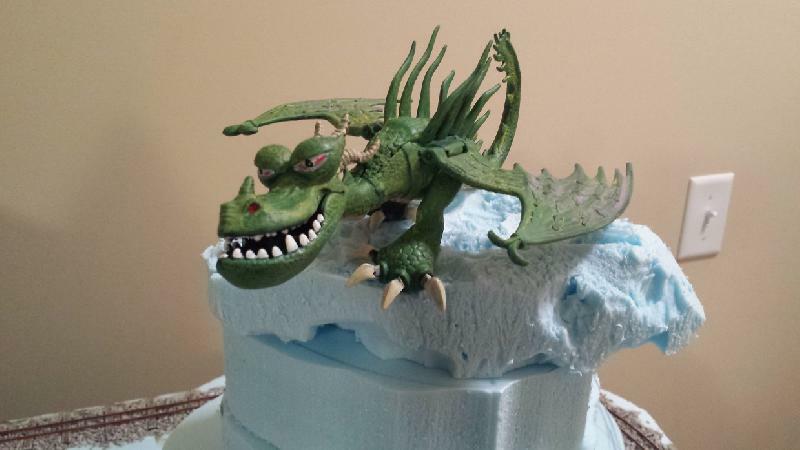 That's excellent work - the stone work and that dragon..! 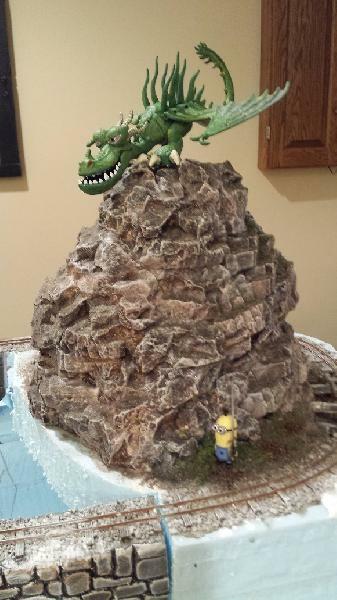 Found a little time over the holidays to work on the dragons hill. Obviously in need of completion but at least it is underway. Decided that Rapunsel will be in one of the towers. I envision a minion on a ladder cutting her hair thus spoiling her rescue.